An ever-changing variety of items are available at the UConn Health Auxiliary Thrift Store. The UConn Health Auxiliary Thrift Shop, located in West Hartford at 270 Park Road, opened in 1993. Like the gift shop, the thrift shop is run by volunteers, and together the shops’ proceeds are the Auxiliary’s primary revenue source. 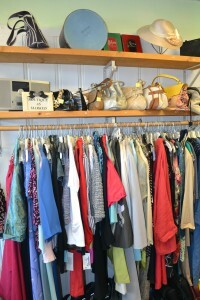 The Thrift Shop provides an avenue to donate unused items and is a boutique in its own right. Donations come from individuals and retail stores. The offerings include high-quality used clothing and shoes for men and women, jewelry, and handbags. Unsold or unwanted clothing is donated to other organizations that assist those in need. We have many name brands such as Chico’s, Coldwater Creek, IZOD, Polo, and Liz Claiborne, and many items are new. Our prices are also not to be believed: For $6 you can buy shirts, blouses, sweaters, pants and shoes and for $10 you can buy jackets, blazers and dresses. We have many other items specially marked such as jewelry, coats, suits, books, DVDs, CDs, purses, hats, ties and linens. We also invite you to donate by dropping your items off at the shop. Interested in donating or volunteering? Give us a call.